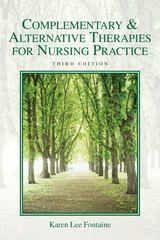 Complementary & Alternative Therapies for Nursing Practice 3 Edition Providing a comprehensive overview of alternative health practices and complementary therapies from a nursing perspective, this enlightening and informative resource covers the principles, techniques, research, health promotion methods and healing practices for specific illnesses and symptoms. This newly updated third edition incorporates the latest research findings, expanded resource sections, additional photographs, and thoroughly updated material. This is a perfect resource for nurses and practitioners in allied health fields who seek to expand their practice to offer wider choices to consumers of health care.